One of the exciting parts of my school's literacy programme is the inclusion of book clubs. Not just as extension for our high flyers but for everyone. I'll admit that it's part of our programme that I'm not brilliant at implementing but I have big plans this term to improve that. One of my existing book club groups has not loved their experience so far; I know that this is, in large part, my fault. I haven't given them as much guidance and input as I should have done. With this in mind I've created a couple of info graphic style posters and hand outs. 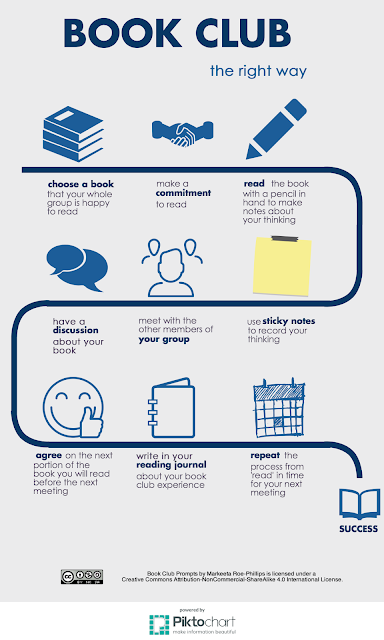 This second one is a quick little 'cheat sheet' to prompt the sorts of discussions that can happen in book club. Again, feel free to download it if you like. What do you think? I'm keen for feedback. Edit (August 17th 2015): You can read my follow up post here. I introduced them during a small group session with each book club, explaining that I wanted to improve their book club experiences. We went over the learning intentions and success criteria of book clubs too. I provided smaller copies of the book club prompts info graphic for the kiddos to have with them during book club, and then asked for specific feedback after their meetings. Mostly positive feedback at this stage, but it also highlighted some misconceptions about the process. So... I will do a follow up post a couple of weeks into using them. :) I think you should blog on the resource you developed!